Bernd Osterloh: "Do we [VW] really need a management board member for group production and one for group sales?" BERLIN (Reuters) -- The head of Volkswagen Group's works council, Bernd Osterloh, wants a pared-down management structure at the carmaker, he told a German magazine, as the company takes stock after the ouster of Ferdinand Piech as the automaker's chairman. Volkswagen's management board is currently made up of nine members and includes positions responsible for procurement, China, commercial vehicles, sales and Audi. "Do we really need a management board member for group production and one for group sales?" Bernd Osterloh was quoted as saying in an interview with weekly Manager Magazin. Piech, at the helm of Europe's biggest carmaker for more than two decades, was forced out as VW chairman last month over his criticism of CEO Martin Winterkorn, who was backed by other stakeholders and labor representatives. 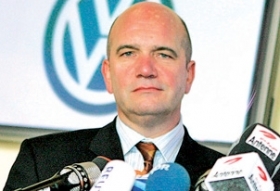 VW is now in transition, looking for a new chairman to replace interim incumbent Berthold Huber, a former IG Metall union boss, while targeting a new structure for the 12-brand group. Osterloh said labor representatives had been discussing a better group structure with the board for six months. Labor’s view is that alongside key board roles such as finance and personnel, the board should include the heads of the group's most important brands and its truck holding, he told the magazine. Osterloh also had some words of criticism for the company's top management, based in the German town of Wolfsburg, saying more responsibility should be given to local managers. "Here in Wolfsburg, some people purport to know what kind of cars Brazilians, Americans or people in India like to drive," he told the magazine. "Strange then, how some of these cars don't then seem to meet customers' tastes." He said that if regional managers did have more responsibility, then maybe VW would have managed to bring out a budget car for markets such as China and Brazil already. VW has for many years been considering a low-cost vehicle for China but has not yet taken a decision on the project.